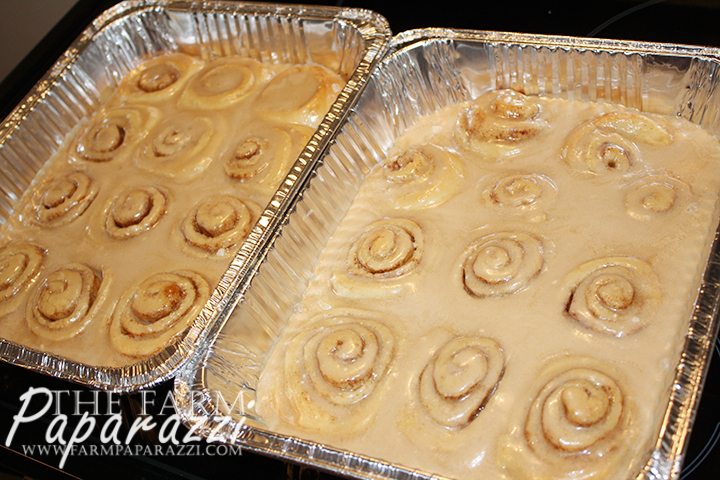 Oh my, the first time I made these Cinnamon Rolls, I died and went to Heaven. My coworker and good friend, Kosha, and I made a load of them to take to meetings we were hosting around the state. 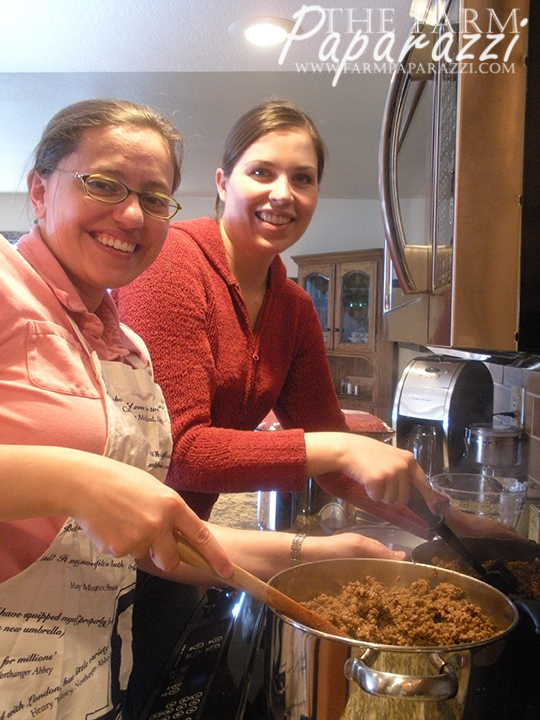 They went perfectly with the Chugwater Chili we made. 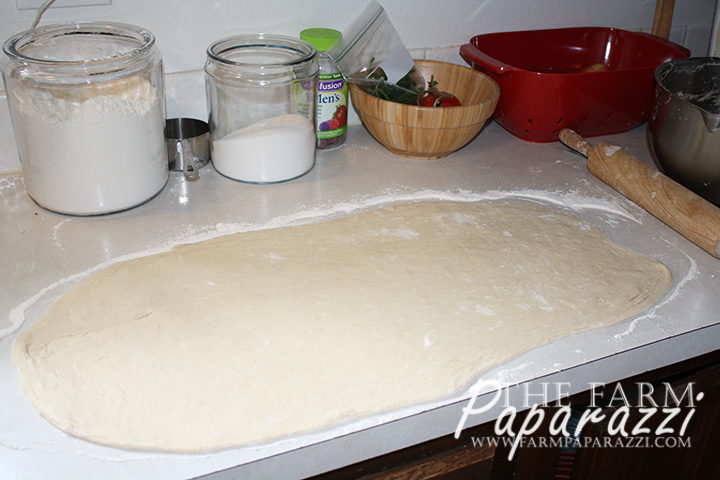 The recipe is copied from The Pioneer Woman – Ree Drummond. While I used leftover dough from the Cabbage Burgers, everything else is pretty much the same as PWs recipe. I probably didn’t use as much butter, but who really uses as much butter as Ree? Ok, well, I probably do. If you’re making these directly after the Cabbage Burgers, like I did, then wipe away the old dusting of flour with a dry cloth. 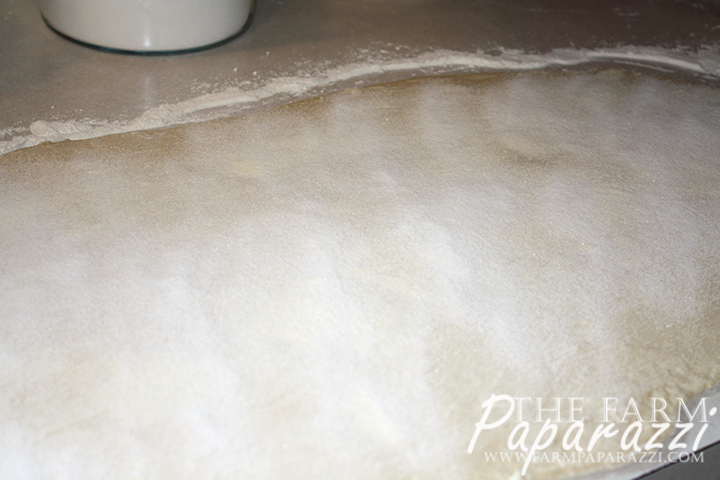 Re-dust the countertop with flour. 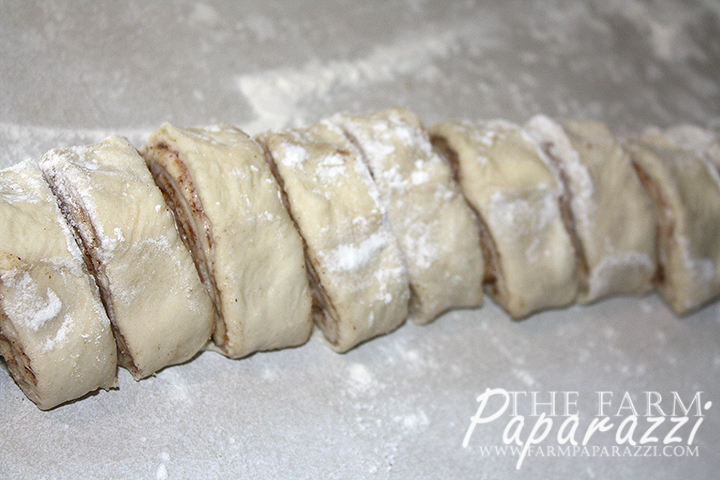 Roll out all the remaining dough with a rolling pin. 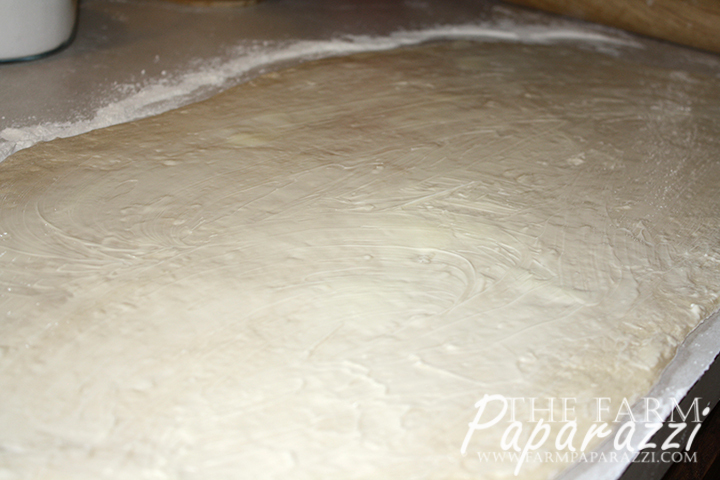 Take the stick of softened butter and spread across the entire surface of the dough. PW tells you to melt the butter, but I like this method better so it doesn’t seep out the ends as much when you roll it up. Sprinkle liberally with sugar (about a cup). 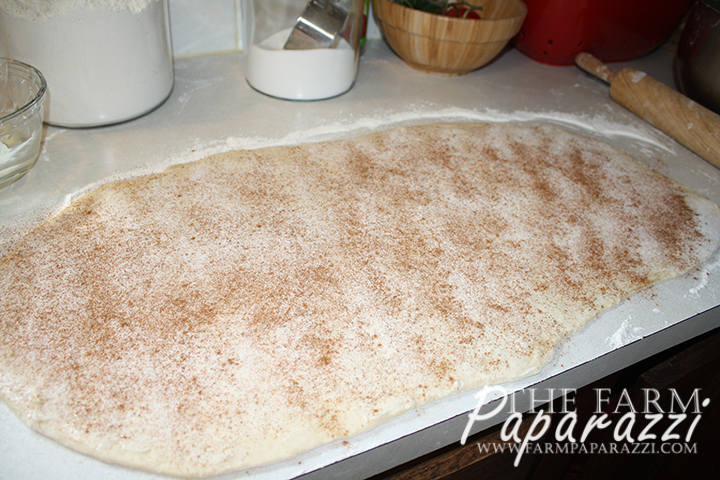 Then sprinkle liberally with cinnamon. You could probably use more than I did. My dusting was a little light. 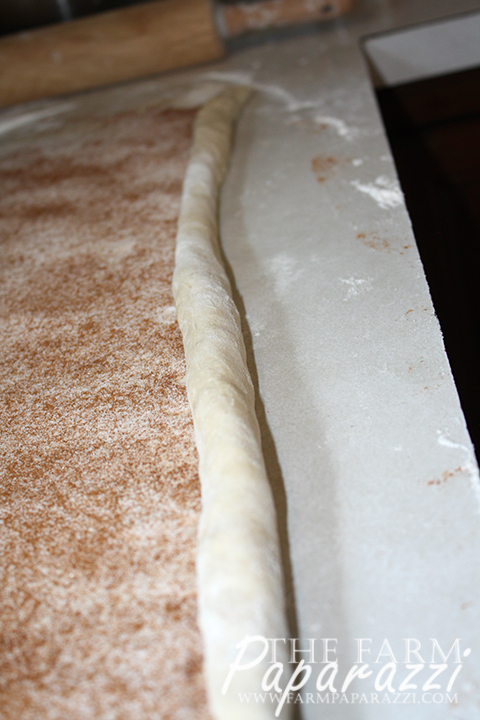 Tightly roll up the dough. 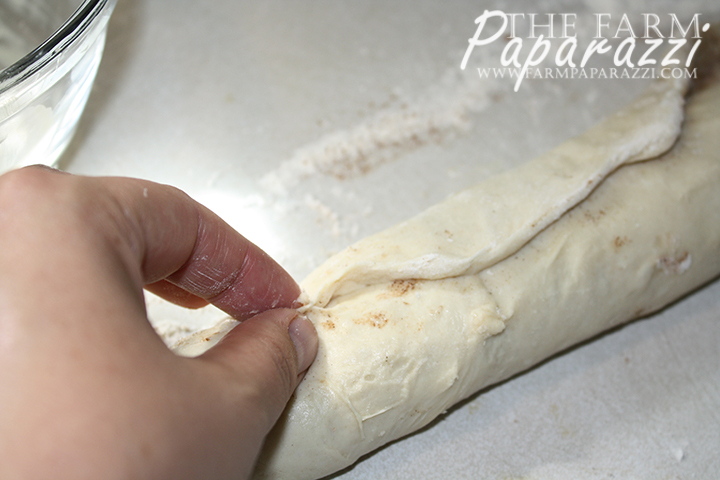 When you get to the other side, pull the dough up to the top of the roll and pinch it into place. Put the log onto a cutting board. Don’t be like me, who cut directly on the counter. 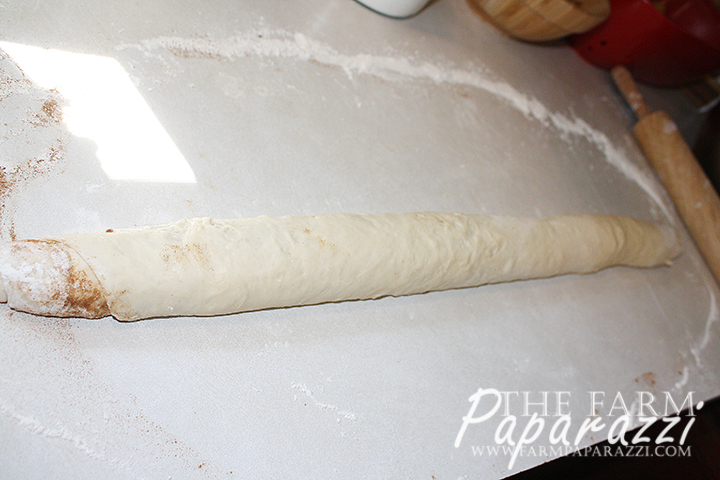 Take a sharp, serrated knife and cut into 1 inch sections. 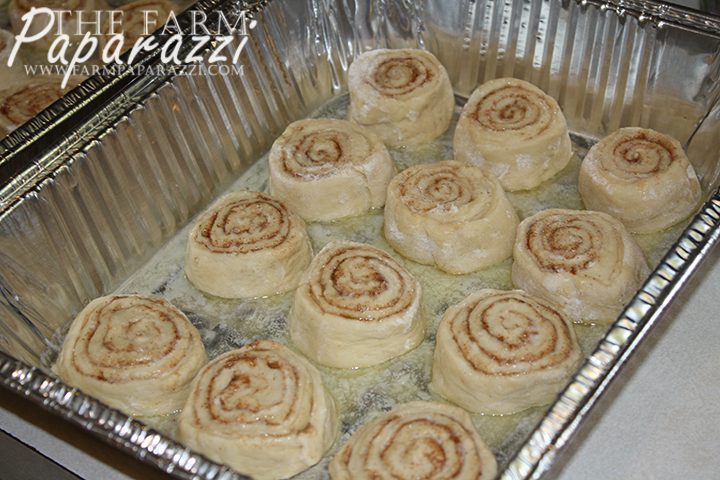 Cover the bottom of each baking dish with a little melted butter and place the cinnamon rolls in the dish. Don’t overcrowd. 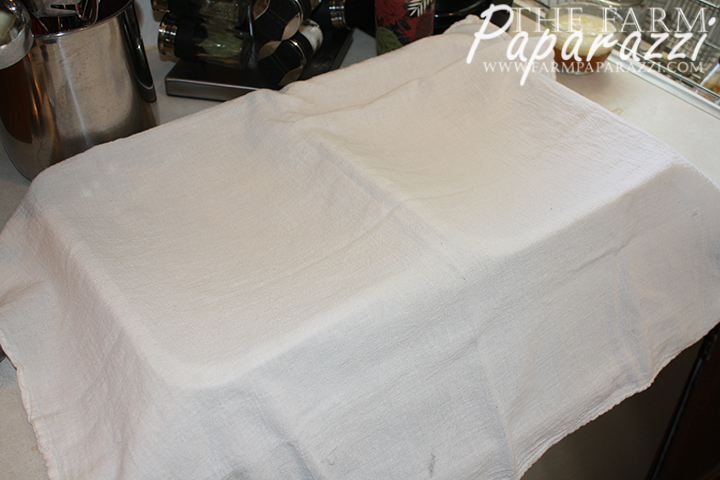 Cover with a dish cloth and let rise for 20-30 minutes. 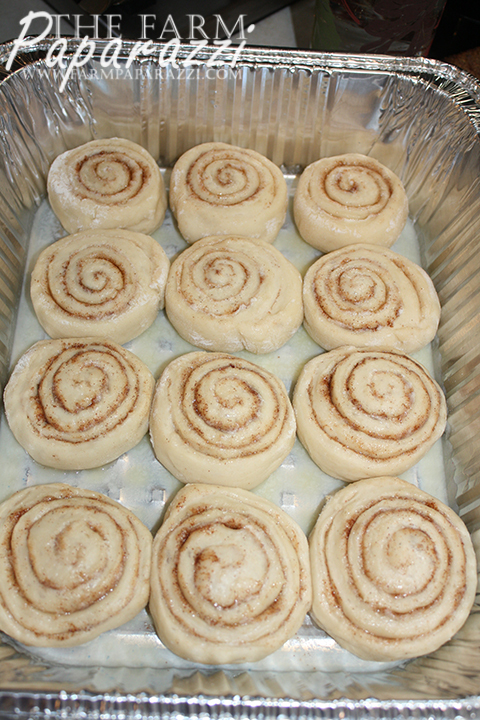 Bake at 375F for 15-17 minutes. Just until they start to get slightly brown on top. You don’t want to overcook them. 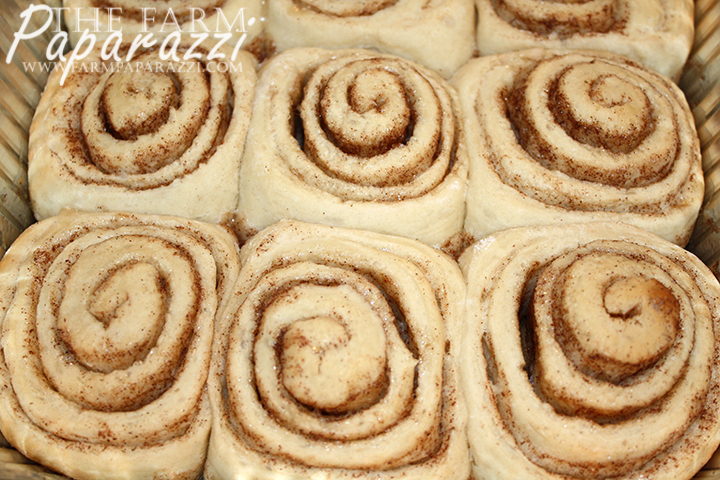 While they’re baking, mix up the frosting ingredients. 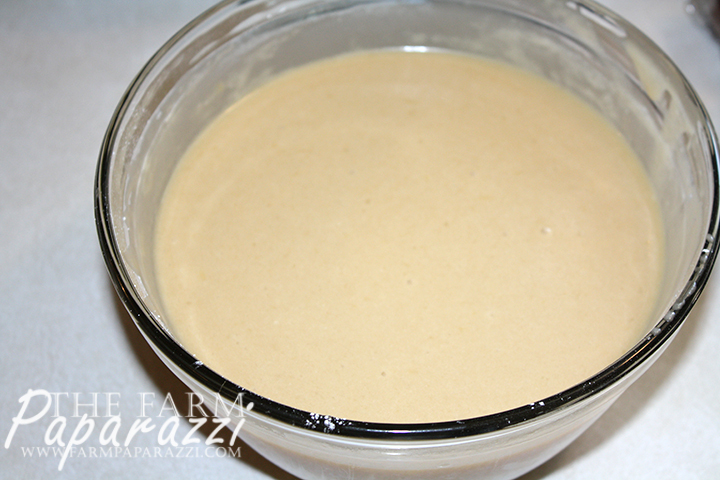 Be sure to slowly add the orange juice to get the consistency you want. It should be pourable, but not too thin. PW uses coffee instead of OJ, but I didn’t have any brewed up. 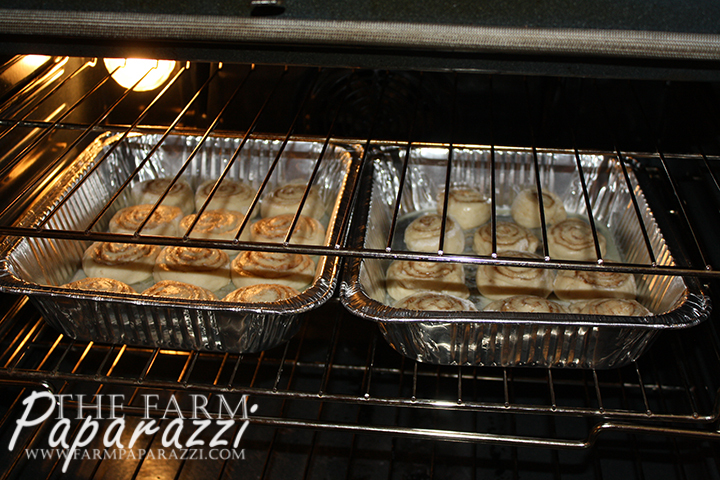 Pour the frosting over the rolls directly after removing them from the oven. I immediately ate the two goofy looking ones near the top of the right pan. It just didn’t seem right to leave them there. Now, go share with your friends so your hips don’t get too big!